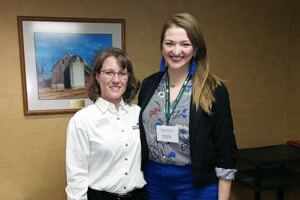 The third annual Women in Agriculture Network, sponsored by University of Minnesota Extension, was held February 15, 2018 in St. Cloud, MN. The theme for the event was “Overcoming Adversity” as today’s farmers face lower commodity prices and economic challenges. Emily Wilmes (Extension) and Carol Peterson (UMASH) presented a session titled “Farm Safety 101” which utilized the Farm Safety Check and encouraged participants to evaluate their farm for possible hazards on a monthly basis. Sarah Schieck (Extension) presented a session on “Emergency Preparedness and Crisis Management for Farms” which highlighted key pieces of an emergency plan and the need for biosecurity measures to keep animals and people healthy. University of Minnesota Extension and UMASH work together as a team to reinforce our message of promoting safe practices in agriculture as injuries are avoidable. Check out our websites for additional information on our resources for your farming operation.